July 18, 2002. Paul McCartney turns 60 years and he introduces for the first time a new Wings keyboard player... I mean, wife, a pretty decent tour around United States and an album called Driving Rain (Capitol, 2001) that's not so bad at all. That day, K-Earth 101.1 FM radio of Los Angeles was broadcasting Beatles and McCartney material all day. People called the station and one of them asked the host which one was the best moment in Paul's solo career. I personally don't doubt at all that his best moment is this record,Tug of War, released on April of 1982 as a tribute to the late John Lennon. The cover suggests us that Paul is stressed while he listens to the latest radio news; i.e., the death of a certain Beatle, the definitive end of the Sixties and the rise of Margaret Tatcher. It is a typically British and nervous album. It contains twelve topics, to my view, related directly with what Paul was suffering then for that, the loss of his band Wings after a sultry arrest in Japan for possession of drugs and the loss of his pal who fell shot in December of 1980 by a maniac obsessed to be as much as possible like him. Paul McCartney meditates on these events in Take It Away" (featuring Steve Gadd and Ringo Starr on drums) and Here Today, a precise song for John who never had the chance to enjoy. If John had listened to it, according to Paul, he would be laughing at her. The song is the continuation of Yesterday, recorded with the same producer, the same acoustic guitar and the same quartet of strings. It is a gift to their group partner's memory. I believe, honestly, that John enjoyed a lot with Paul's songs. If it was not to admire them, at least I believe that he listened to them attentively to criticize them just for pleasure. In fact that he listened the last album that McCartney recorded with the Wings before John died, Back To The Edge (MPL, 1979) and he also enjoyed one of Paul's most curious singles,1980's "Coming Up". But John never told him he was listening. It was Yoko Ono who told to Paul that John used to listen his discs and that once he even cried with one of them. But Lennon was rude and he was not a crybaby. We know he once admitted he sabotaged Beatles work during the later years. In Tug Of War we find two nuggets featuring Stevie Wonder "What's That You're Doing"? (Funk-a-la Wonder) and "Ebony and Ivory", a song against intolerance surprisingly on racism, but against the discussions that Paul used to have with Linda. Men as him will always have the luxury of having a good woman by his side towards the one who to discuss placidly. Stevie shines as collaborator in this disk and, really, the show is stolen in the two songs. Sew curious: Paul recorded the video of " Ebony " using a hint without Stevie. Sew of the life. Will something have to see the fact that Stevie Wonder put the song like co-composition of McCartney and his, and in the Tug Of War appears as of McCartney only? I would love to ask Paul a question like this. The production runs in charge of George Martin, and the disk sounds almost to a production at level Beatle. However, it lacks the power of this recordings. Ringo Starr is present, Stanley Clarke in the first floor in The Pound is Sinking", Carl Perkins sings in Get It", but the topics that the palms are taken are Dress Me Up ace to Robber" that is Paul playing to be Earth Wind & Fire, and the already mentioned Take It Away", available on the Hits & History collection. Paul McCartney is 60 years old, and let us hope it continues giving that to speak and to listen for a good while. A good conversation topic is this, its work teacher. To buy it it has been said. (Capitol, 2001) que no está mal, pero pudo haber salido mejor. Aquel día la radio K-Earth 101.1 FM de Los Ángeles estuvo pasando canciones de Los Beatles, de los Wings y de Paul solista hasta por gusto. La gente llamaba a la estación y preguntaba por él y cuál era su mejor momento. Yo no dudo que es éste disco.Tug of War, lanzado el 26 de Abril de 1982, lo tiene todo. La portada nos sugiere que Paul está estresado mientras escucha cierta música, probablemente la suya. Es un disco típicamente británico y nervioso. Contiene doce temas, a mi parecer, relacionados directamente con lo que Paul estaba sufriendo por ese entonces, la pérdida de su banda Wings después de un bochornoso arresto en Japón por posesión de marihuana y la pérdida de su compinche y archirrival John Lennon, quien cayó abaleado en diciembre de 1980 por un maniático obsesionado por ser como él. Paul McCartney reflexiona sobre estos eventos en "Take It Away" (con la participación de Steve Gadd y Ringo Starr en la batería) y "Here Today", una canción precisa para John pero que quizás no la haya podido disfrutar del todo. Si John la hubiera escuchado, según Paul, se estaría riendo de ella. La canción es la continuación de Yesterday, grabada con el mismo productor, la misma guitarra acústica y el mismo cuarteto de cuerdas. Es un regalo a la memoria de su compañero de grupo. Creo, honestamente, que John Lennon disfrutaba mucho con las canciones de Paul. Si no era para admirarlas, por lo menos creo que las escuchaba detenidamente para criticarlas a gusto. De hecho que escuchó el último álbum que McCartney grabó con los Wings antes de que John falleciera, Back To The Edge (MPL, 1979) y también disfrutó el single más curioso de 1980, "Coming Up". Pero John nunca le dijo "oye, qué buenos discos que has estado grabando, realmente me gustan". Nunca lo motivó. Yoko Ono le dijo a Paul que John solía escuchar sus discos y que en alguna ocasión hasta habría llorado con uno de los temas. Pero Lennon era rudo y no era un crybaby. Lennon tenía otros planes en mente. En Tug Of War hay dos temas con Stevie Wonder, "What's That You're Doing?" (Funky a-la Wonder) y "Ebony and Ivory", una canción contra la intolerancia curiosamente escrita no contra el racismo, sino contra las discusiones que Paul solía tener con Linda. Hombres como él siempre tendrán el lujo de tener una buena mujer al lado para con quien discutir plácidamente. Stevie se luce como colaborador en este disco y, realmente, se roba el show en las dos canciones. Cosa curiosa: Paul grabó el video de "Ebony" usando una pista sin Stevie. Cosas de la vida. 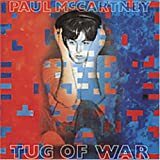 ¿Tendrá algo que ver el hecho de que Stevie Wonder puso la canción como co-composición de McCartney y suya, y en el Tug Of War aparece como de McCartney solamente? Me encantaría preguntarle a Paul una pregunta como ésta. Paul McCartney tiene 60 años, y esperemos que siga dando que hablar y escuchar por un buen rato. Un buen tema de conversación es ésta, su obra maestra. A comprarla se ha dicho.